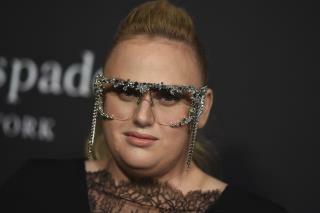 (Newser) – Rebel Wilson is making the rounds to promote her upcoming rom-com Isn't It Romantic, but she had less than perfect pitch on Ellen DeGeneres' show last week. Per HuffPost, the Australian actress told DeGeneres she's glad Hollywood is starting to see less-stereotypical roles for plus-size actors, and that "I'm proud to be the first-ever [plus-size] girl to be the star of a romantic comedy." Which may have been a simple bit of self-promotion, except for the fact there have actually been other plus-size women to star in such movies, including Mo'Nique and Queen Latifah, as one Twitter user pointed out. Yet Wilson tweeted back that it was somewhat of a "grey area," splitting hairs on whether the movies those actresses had starred in fell under the "studio rom-com with sole lead" category, and whether the actresses had actually been plus-size during filming. She may not be the first plus-sized lead in a romantic comedy, but she IS the first fat lead who looks like a dude. Here's some fodder for our resident punsters - citations from her Wikipedia article. "She completed her Higher School Certificate in 1997, including second place in the state in food technology." "'I was very academic at high school and was always good with numbers.'" "She has spoken of malaria-induced hallucinations." "Wilson is most known for her roles as Toula on the SBS comedy series Pizza [and its spin-off movie Fat Pizza]..."